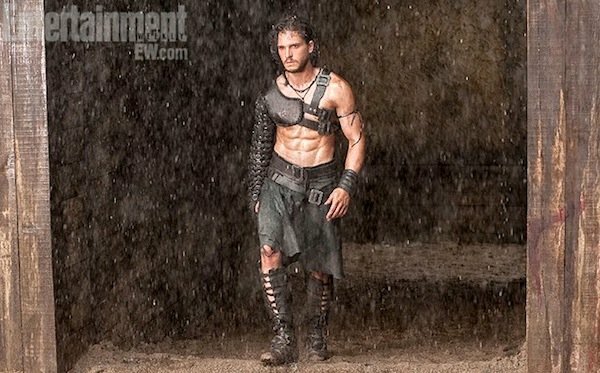 Either Kit Harington's been spending a lot of time working out lately, or Game of Thrones has been depriving us of his serious ab situation for far too long, keeping young Jon Snow all bundled up in cold-weather attire. As it happens, Harington underwent a physical transformation for the starring role in Paul W.S. Anderson's Pompeii. He spoke to EW about the weeks of training he did to bulk up and then "shred down" to take on the role of Milo in this film about a slave that goes on to become a gladiator. A gladiator set for vengeance? Sounds like Pompeii could be just the fix Spartacus fans are going to need in the winter, which is when the now wrapped-up Starz series usually aired. Except in the case of Pompeii, this story's coming to us on the big screen and in 3D. Directed by Paul W.S. Anderson and set to arrive in theaters next February, Pompeii is said to take place during the days leading up to the eruption of Mount Vesuvius. Harinton plays the mentioned slave on a ship heading for Naples, working to save the woman he loves and his best friend, a gladiator trapped in the city's coliseum. It sounds exciting, and the film should give Harington the opportunity to show off his talents as a leading male on the big screen. In addition to Harington, the film also stars Emily Browning as Cassia, Jessica Lucas, as Ariadne, Jared Harris as Cassia's father Lucretius, Kiefer Sutherland as a visiting (and villainous) Roman senator. Also set to appearing the film are Carrie-Anne Moss and Adewale Akinnuoye-Agbaje.